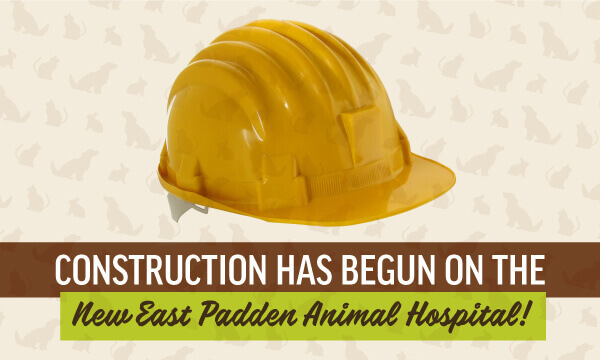 East Padden Animal Hospital is excited to announce that we’ve broken ground on our new hospital located about a half mile from our present facility. This new hospital isn’t a second location; when completed, it will be the new permanent home of EPAH. The new building will take us from 2800 square feet to 7000 square feet, and include a roomy new lobby area, five more exam rooms, seven more boarding runs, three fenced exercise yards and an outdoor consultation/privacy area. Even more exciting is the fact there will now be 21 parking spaces just for clients! We hope to be in this beautiful new hospital and ready to serve you and your pets by the end of the year and anticipate a fun “grand opening” when we finally make the move. We’ll be sure to send you an invitation and hope to see you there! 3 Responses to Construction Has Begun! Congratulations! I am very excited for all of you since the Vancouver area is supposed to continue growing in population, you will need the room. I appreciate going to a veterinary clinic where there is room for the staff to work and plenty of parking for the clients. I can imagine how excited all if you are!! Congratulations on a new building. Having spent one day a week for the last 7 weeks in your facility I can definetely see why you need a bigger area. What is the new address or location?? That’s a crucial bit of info!